Steroid hormones are structurally derived from cholesterol and play a role in a wide range of physiological processes, including carbohydrate metabolism, fat and protein metabolism as well as in stress response. They are secreted by the adrenal cortex, testes, ovaries, and during pregnancy by the placenta. They are transported through the bloodstream to the cells of various organs where they influence and regulate the organs’ physiological functions. The determination of hormones is important for the diagnosis of a number of diseases such as adrenogenital syndrome, hyperaldosteronism, or tumours. By using LC-MS/MS, not only high sensitivity and specificity can be achieved, but also the efficient measurement of multiple analytes in a single run. 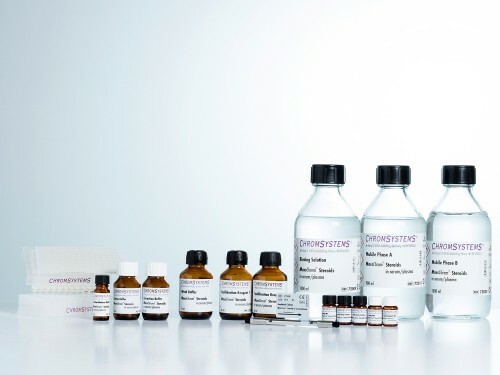 This MassChrom® Steroid kit allows the quantitative determination of 15 steroids in serum/plasma by LC-MS/MS and includes the clinically most important parameters. Sample preparation is the same for both steroid panels using an optimised and efficient SPE sample clean up procedure with 96 SPE well plates. The use of stable isotope-labelled internal standards for every single analyte ensures reproducible and reliable quantitation of the steroids. 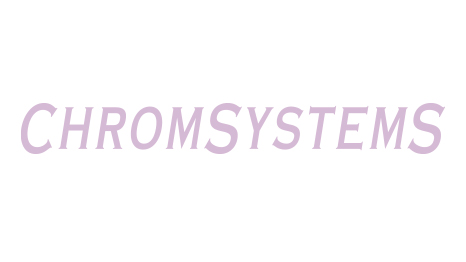 The method does not require a high-end LC-MS/MS system to be carried out. Alternatively, there is also a method available using Sample Clean Up Columns (72072/C). Put 96 SPE Well Plate onto Waste Plate. Pipette 0.8 ml Equilibration Reagent 1 into each well of the 96 SPE Well Plate, centrifuge and repeat with Equilibration Reagent 2. Pipette 500 μl sample/calibrator/MassCheck® control, 50 μl Internal Standard Mix and 450 μl Extraction Buffer into each well, mix briefly (vortex) and centrifuge. Add 2 x 0.7 ml Wash Buffer and centrifuge. Place plate onto the Collection Plate. Add 500 μl Elution Buffer and centrifuge. Evaporate eluates in the Collection Plate (nitrogen or compressed air) to dryness. Add 100 μl Reconstitution Buffer. Shake Collection Plate, seal with adhesive seal and inject 5–50 μl of the eluate. The stability depends on the specific steroid. Further information can be obtained from the instruction manual.